Sometimes you have so many ready-made expectations that you fool yourself. It happened to me the day I met Irina. I was interviewing Masha before her show at Nikolskaya Gallery and did not give much credit to this beautiful young woman wearing strass-customized jeans. It was such a sexist bias and I feel terrible about it now. In Paris, you expect a gallerist to be unsmiling and to adopt a very minimalist black and white statement outfit. Thankfully, social media worked its magic and I read about a Pop Up Museum about to open. My curiosity lead me back to Irina and I was very lucky to discover the PopUp Museum a few days before its opening. Take a Moscow suburb. Imagine your way through the metro orange line. Turn to an ordinary street. Look up and you’ll see the sign : a red tower is looking down to you. Neo Geo business center was opened last year. If its location is not its main asset, it definitely looks like a great version of a business center : airy common parts, modern architecture, a wide choice of restaurants and shops to answer your everyday needs. Even a tennis court for those who fancy it. In this very business center, until the end of the year, a full collection of artworks is planted, displayed in several galleries and open to all. 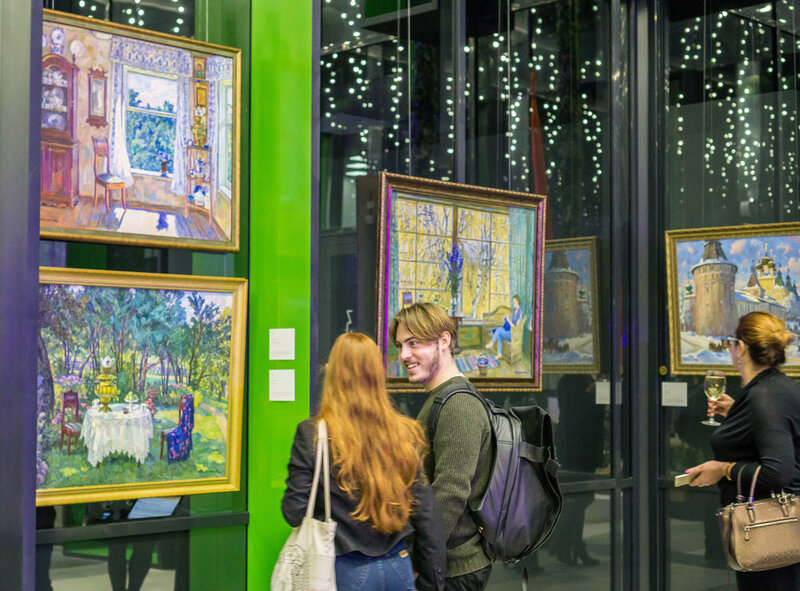 Gathered from living Russian artists, paintings, photos and sculptures are hanged to offer the audience the full picture on current Russian art. The bet is to show everything, without the usual weighing of bankability and fashionability and to take off the bias of the market. Yet, everything is for sale. After calling up their network of artists, Irina, Elena Lisenkova and Galina Merzlikina ask them to send pieces. This wish was fulfilled beyond expectations and their storage is packed, allowing them to make a turn over of the pieces. The result is six galleries filled with art works. The colorful glass architecture creates a lively atmosphere where you can have a glimpse at residents’ studios and offices while looking at the collection. Galleries were curated in order to make us discover different aesthetic movements or recurrent themes : social realism, realism, impressionism, post-impressionism, figurative art, avant-garde and abstract direction, sculpture. Even before meeting with Irina, I thought the concept was great but had no idea just how much, due to my newcomer prism. What she likes to call an experimentation aims to shake up four characteristics of usual exhibitions in an innovative way. The PopUp Museum is open for more time than any other commercial exhibition, allowing the team to work on a real promotion of it and to create content for artworks to be better understood (lectures, workshops, movies program and so on…). On the other hand, this is not a real museum with all the weight of the institution and space management implications. The PopUp Museum is more like a start-up : agile, fast-paced, experimental and learning. By wanting to exhibit a range of works as comprehensive as possible, the PopUp Museum explores a blind spot of the Russian art market. As such, the concept is daring and reveals the current practice of many - used to be - known artists. It is also very interesting and rare to have a real artistic overview gathered in one place. Events such as CosMoscow may give you an idea about the current art market but the market is not the creation. The weak spot of this approach lies in its very openness : Is anything worth showing ? At the PopUp Museum, I was surprised by how the general idea of Russia the collection conveyed. Are Russian artists that fascinated by the everlasting country we fantasize from Europe ? A wide land, omnipresent nature, small villages where colourful traditions nest, everyday scenes of labor or streetlife… If so few works reflected on the country’s history of the previous years (from the soviet system to the contemporary reality), is it because I am missing keys to understanding or because Russian fatalism put its mark on art by leading artists not to express on it through their work ? How to engage the audience ? This is a very crucial question shared among cultural spaces as well as any customer service. Here the statement is that by immersing people in art, it will create a special relationship and a renewed attention to it. Confronting the pieces with reality is also a great way of revealing their meaning outside the muffled atmosphere of traditional museums. If the PopUp Museum is an opportunity to test a new way of selling art for a commercial gallery, its value is definitely shared by all parts. First, the open call logic allows artists to show new works and gives them a chance to discover a new side of their art. Then, it creates new partnerships between usually distant worlds : galleries and real estate. Art and initiatives such as the PopUp Museum can be used as a territorial development tool. The PopUp Musuem is unique by offering a qualitative art venue outside of Moscow’s center. This value should be understood by local authorities who need to promote their area. become a center of cultural attraction for the citizens"
To know that this project was brought together within only two months blew me away and I loved discovering the strategic thinker - pragmatic executioner of it. Following my quest of understanding the generation at work, I tend to over analyze every hint I get from people I meet. After my chat with Irina, I drew some parallels between French and Russian situations in spite of the very different context. The Russian art market is young, yet by wanting to exist on a world level, it embraced its flaws all at once. The business models are congealed, new artists or unknown ones have trouble being seen. Also, education and accessibility are a stake institutions fail to fulfill on their own and private-public partnership are not an efficient tool yet. In this intricate context, Irina threw her ammunition into the battle. After studying finance, working in PR and marketing, she applied to an Art management course. Going the traditional way (exhibition in her gallery, collectionneur networking…) was not satisfying enough for this demanding young woman who grew up as the country was wildly opening to the capitalist system. She sees herself as a business woman and as such was able to talk art business and to take it to a new level, beyond the usual positioning of private investment and collection, even beyond the aesthetic consideration of “will it fit in my living-room?”. One can criticize her pragmatic vision of artists as brands and artworks as content. If ever this sounds cynical, it is not hypocritical. And what is more : she tries, she takes risks, she shakes things up and makes it happen, hoping for a better future, more art in the city, more people caring about art. She takes pride in her commitment to action. As a mother always seeking a better family-work balance, and as member of the community, Irina hopes that in her testimony, young people can find the drive to empower and define their own job without overlooking what it takes. After dedicating herself to reveal recognized yet not famous artists and their work, Irina’s next hurdle could be to challenge people to embrace every opportunity the digital revolution has brought without fear. “We live in a fantastic time. Of course, we have to deal with a lot of information every day, and people get afraid. But they should understand that it is an amazing opportunity. We should develop and explore it more. Today, our weak spot is the Russian educational system. We educate our children like in the past and they will not be ready to understand what’s going on. We have to give some meaning to technology, to explore it, instead of giving in to laziness and fear. We prefer to be conformable and it is difficult to change : I get it. But we have just one life and we should make the most of it”. More about Irina's gallery and the Pop Up Museum here. Credits : photos are courtesy of Irina or taken by me.